Ed from the Chemical Brothers talking about New Order/Bernard in the Irish Times. Their initial meeting was memorable. “We lived in the basement of a house in Manchester that was historically an after-hours party venue,” Simons reveals. Nice to know that I’m not alone in trawling YouTube for obscure interviews by the band. Man, I love ‘Here To Stay’ and ‘Singularity’. Two of my absolute favourite post-Factory NO tracks. Kind of New Order related. Bizarrely , old footage of Tony Wilson in last night’s Halloween special of Inside No.9 on BBC2. And also footage of I think the old Granada studios where New Order did their MIF gigs. sinker at first and was about to turn it off and go to bed until I began to realise something was afoot when during the “ replacement “ clip of an older episode of the programme, A Quiet Night In, a ghostly figure appeared outside the window in a scene . I didn’t recall that being in the original airing of that episode. Confused? You’d have to watch last night’s Inside No.9 to work it out. Blue Monday for the win. Steve finally joins Can. Sort of. You have won the prize for finding the weirdest new order reference I've seen. 3 users thanked LostSiren for this useful post. 1 user thanked CuanaD for this useful post. 2 users thanked LostSiren for this useful post. Ben Kelly is best known as the designer of the Haçienda nightclub in Manchester, [formerly] owned by New Order. One of the features of the club was its columns, painted with diagonal black and yellow stripes. Ben told me: “If you choose the right combination of materials, you can make them sing” and I think these columns have become Ben’s “chorus”. Thirty-six years later, he had a stunning exhibition of stark, bold columns made of mirrors, metals and plastics, each one uniquely shaped and vividly coloured. For me it’s an emblem of how we must embrace diversity if we’re going to hold this world up. In new Charlie Brooker film Bandersnatch on Netflix, the computer game creator Rickman has a large Power, Corruption & Lies poster in his flat.The film is interactive though so it was entirely by chance and choice of path to take that i ended up at that scene. If I’d chosen one of the multiple other paths I might not have reached that scene. Confused? Yeah me too. 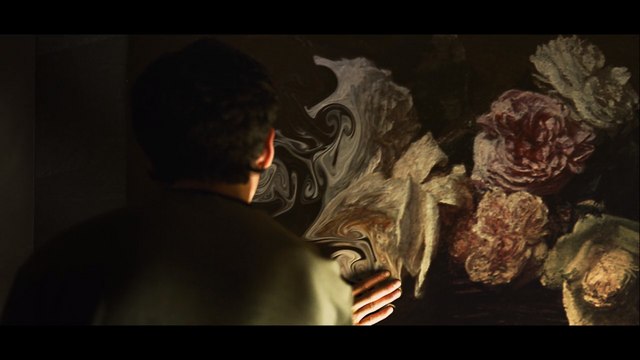 Ooh, later in the scene the main character Stefan, after taking LSD,starts manipulating the flowers on the P,C & L poster and they start swirling and changing. Whoah. Was reading about Bandersnatch earlier and thought I’d give it a try at some point. I’m never really sure about Black Mirror. Every episode I’ve tried (about 5 of them) has left me feeling underwhelmed. Some really great ideas, but, somehow, the payoff never really seems worth it to me. I’ll try the new one as it’s a really interesting idea. Yeah not all the stories are great.The early episodes like 15 Million Merits or The Entire History Of You when it used to be on Channel 4 some years back were on the whole better than what's been on it since it went to Netflix (all or most of the series including the early Channel 4 ones are now on that).The stories since it's been on there haven't quite hit the highs of the Channel 4 ones. but almost didn't notice the upper right at first. saw that the girl in the bumblebee movie had a procession poster on her wall. Nice to see the band get some recognition in big films. Also, it’s nice to see more obscure references rather than the obligatory Unknown Pleasures t-shirt or Blue Monday / BLT on the soundtrack. Bizarre Love Triangle (12” Dub Version/I Don’t Care dub) on Erol Alkan’s New Year’s Eve show on 6 Music.Coincidentally I’d looked this track up and gave a spin just a day before as hadn’t listened to it in years. Alkan mixed in a track called Upstart by Miss Kiitin & The Hacker after, great bit of mixing. This page was generated in 1.279 seconds.